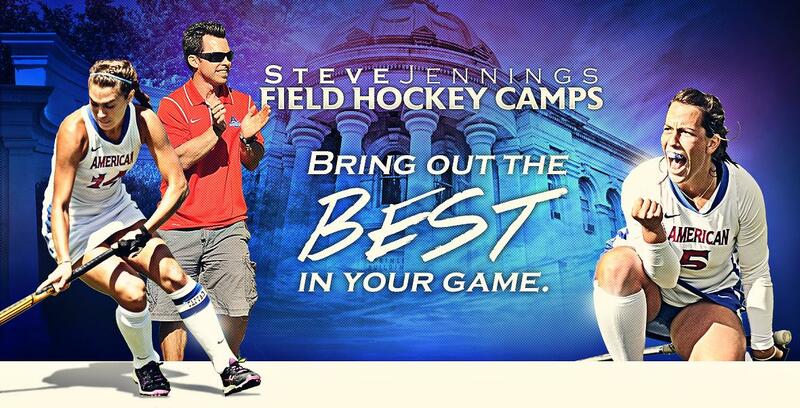 The aim of Steve Jennings Field Hockey Camps is to provide a competitive and fun atmosphere. It is open to any and all entrants who are rising 7th graders and above. Players will grow under level-specific coaching by top instructors who can personally demonstrate skills and explain tactics. Special attention will be given to advancing basic skills, creating opportunities for players to absorb and execute more complex aspects of the game. Significant exposure will also be given to advanced concepts and skills that are being used at the international level. Now heading into his 18th year as head coach at the American University, Jennings has experienced remarkable success with the Eagles. Highlights include nine championships in the Patriot League, eight trips to the NCAA tournament and two trips to the Elite Eight. In 2004 Jennings was selected as the National Coach of the Year and was elected to the NFHCA Hall of Fame in 2012. In addition to coaching at AU he has served as an assistant to the U.S. national team coaching staff going to 2 World Cups, 2 Pan American Games and the Olympic Games in 2008. He served as the Junior National Team coach at the Junior World Cup in 2013. As a player for the U.S. Men's National team, Jennings competed in 2 Pan American Games winning the bronze medal in 1995 and vice captained the 1996 Olympic Team in Atlanta. Coach Jennings wil be assisted by coaches who instruct at the NCAA Division I level, players with international and NCAA Division I experience as well as goalkeeper specialists.